Another lazy weekend review. I'm glad Tara decided to convince me to keep going on the book because my first impression turned out to be wrong. 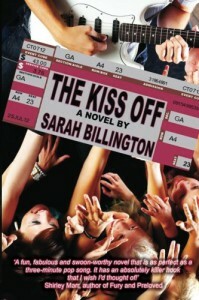 At first, I thought The Kiss Off read like a tween book with some naughty words added in for giggles. It caught me by surprise when the story took a turn into more serious subject matter.I've said it before but I'll say it again here : I could never date a celebrity and still manage to keep my sanity intact. It's no surprise that Poppy had to overcome several speedbumps (everything from paparazzi stalking to an embarrassing sexting incident) before she figured out whether or not to give her relationship with a budding rock star a chance.This was a cute and short little read. I did feel like the story was a bit frantic and all over the place for the first 20% of the book but after the pacing stabilized, I started to enjoy myself. It's hard to place this book into an age range. I read quite a bit of YA, so I'm not sure why this one felt so young to me, when this is definitely not a middle grade book. Between the sexting incident, the swearing, the drinking, etc., the content leans heavily toward older YA. For whatever reason, the tone/voice of the characters read as younger than their ages. Maybe I'm so desensitized now with YA characters who sound like adults and this book is "technically" more realistic for how teens generally interact, but the vibe read younger than what I'd normally prefer. Then again, I can respect that I am not the intended age range of readers for this book. I'd recommend The Kiss Off mainly for younger teens or older teens and adults who don't mind reading fun/fluffy love stories with a little bit of back and forth drama.